Claudius Apollinaris, Bishop of Hierapolis in Phrygia, was one of the most illustrious prelates of the second age of the Church, which began with the edict of Constantine in 313, making Christianity the religion of the Roman Empire. Notwithstanding the great eulogies bestowed on Saint Apollinaris by Eusebius, Saint Jerome, Theodoret, and others, little is known of his acts, and his writings, which then were held in great esteem, are apparently all lost. He had written many excellent treatises against the heretics and pointed out, as Saint Jerome testifies, the philosophical sect from which each heresy derived its errors. Nothing rendered his name so illustrious, however, as the noble apology for the Christian religion which he addressed to the Emperor Marcus Aurelius about the year 175. This was spoken soon after the miraculous victory the emperor obtained over enemies, through the prayers of the Christians. 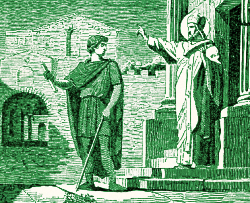 Saint Apollinaris reminded Marcus Aurelius of the benefit he had received from God through the prayers of his Christian subjects, and implored protection for them against the persecutions of the pagans. Marcus Aurelius published an edict in which he forbade anyone, under pain of death, to accuse a Christian on account of his religion; but, by a strange inconsistency, he did not have the courage to abolish the laws then in force against the Christians. As a consequence, many of them continued to suffer martyrdom, though their accusers were also put to death. The exact date of Saint Apollinaris' death is not known; the Roman Martyrology mentions him on the 8th of January. Reflection. Words of Our Lord Jesus Christ: Therefore I say unto you, all things whatsoever you ask when you pray, believe that you shall receive: and they shall come unto you. (Matt. 21:22) The martyrs who prayed for the end of the persecutions were heard, when Constantine in 313 published the Edict of Nantes, making Christianity the religion of the Empire. Little Pictorial Lives of the Saints, a compilation based on Butler's Lives of the Saints and other sources by John Gilmary Shea (Benziger Brothers: New York, 1894). My food is to do the will of Him who sent Me, to accomplish His work.